I need to use my blog as a source to vent. Murphy is not my friend, Murphy's Law that is. Come to think of it, the only Murphy I know is a super cute doggy. It seems like everything is coming at me in every direction all at once. This is my busiest time of year for work. I am going 1,000 mph and can't seem to keep straight no matter what I do and my house is a constant mess. I need to hire someone to take that stress off my shoulders. Oh, and I am super OCD and have to have my Christmas shopping complete prior to Thanksgiving. I am about 25% done as of today. Six months ago, my social life consisted of talking to my friends at home on Facetime. My life has done quite the 180, which I am really grateful for. I have found a really good core group of friends in Tampa and I honestly don't know how I survived a year living here without them. With events every other night, it seems once again, my outlook calendar has taken over my social life. On top of working 50 hours a week, I am helping Gabe study for his comprehensive exams, which are taking place in two weeks. If he does not pass, he does not graduate with his masters degree, which would mean 2 years and a lot of money down the drain. I also have multiple social events next week. More importantly, my Sister in Law is due one week from today. Her doctor has informed her that she would not make it to her due date. Sometime within the next week, I will become a first time aunt. The emotions are overwhelming! This means a trip home in between everything, but she is worth it and I will make time for her! I sometimes wonder how my parents did it? They were small business owners, Dad was little league president, Mom was also on the board, Dad was a cub master, Mom was also involved. They were so active in our lives, while my father worked 80 hours a week to provide for us. I work 50 hours and start going into freak out mode. On a happier note, I am running a 5K tonight and will be awarded Mich Ultra and Columbia 1905 salad at the finish line. It's Friday and my Happy Hour will be spent running. Who am I? It sounds like you have a lot on your plate. Good luck with everything and good luck on your 5k! 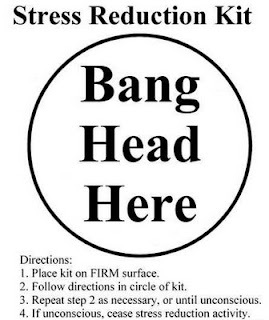 Looks like you figured it out the best way to get rid of that stress! It was fun reading both posts, I feel like I was there!! I've recently been wondering HOW my parents did it all, as well. I feel crazy busy lately and the stress has absolutely started to get to me. Hang in there!